What’s ZMOT Got To Do With It? I’ve known Jim for quite some time as our paths have crossed repeatedly in the world of search and the streets of Chicago. I’ve always been impressed with his ability to relate to brand marketers and put key principles of Google into a broader marketing context. And ZMOT is no exception. ZMOT underscores the point I was trying to make in Chapter 4: Mindset Matters. ZMOT is the moment after some stimulus has compelled you to act but before you actually take action. In a shopping scenario, ZMOT is the moment when your decision takes shape of whether or not to buy and, if so, which brand. In his book, Jim describes a new “mental model” in which ZMOT follows a stimulus but precedes FMOT (a term coined by P&G for the first moment of truth at the store shelf) and SMOT (the second moment of truth when the consumer experiences the product that he/she purchased) before reappearing when the buyer decides if the brand is a keeper and worthy of sharing with friends (or, in marketing terms, lifetime value and word of mouth). So how to make sure your brand is available at ZMOT? Well let’s turn to Chapter 17: Show Off Your Assets. Aptly, in this chapter I recount a meeting with none other than Mr. Lecinski at the Google Chicago office in 2006 in which he preached about the importance of brands digitizing and optimizing all their assets — images, videos, manuals, and even brand attributes. In my book, I point to Ronald.com as an example of McDonald’s digitizing one of its assets, the Ronald McDonald mascot. But beyond just Ronald himself, McDonald’s took the brand promises of happiness and giving and optimized them for kids around the world to experience in a safe virtual playground. There’s no question McD does well at ZMOT. (Hmm, I’m hungry, what should I eat?) But it’s not just because there’s a McDonald’s in every major city and most of the not-so-major ones. And it’s not simply because there’s a McDonald’s ad that reaches you when you’re hungry and/or close to one of their locations. And it’s not only because the food comes out fast and there’s a ball-pit for your keys to play in. It’s because of all these things! McD does well at ZMOT because of all the touchpoints they’ve created with consumer and the emotional connections they’ve built. However, as Jim argues credibly time and time again in his book, all the connections in the world between brand and consumer are meaningless if the brand is absent at ZMOT. But then why are people searching for hamburgers online? Why are they searching for McDonald’s? You spend billions of dollars on marketing and you’re willing to risk it all when a consumer acts on your stimulus and can’t find you at ZMOT? Luckily, the McD ad exec remained open to the idea and, within a year, SEM was a staple on the company’s media plans. To me, this example is the epitome of what the ZMOT book is all about. It’s 75 pages of persuasion to quick serve restaurants and other verticals (eg, CPG) that have yet to truly embrace SEM. Now, lest you think this is a fluff read relying on heady ideas and intuition, I should note that, throughout his book, Jim backs up assertions with hard data. 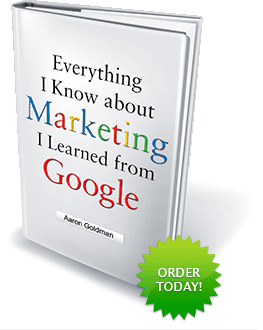 In researching this book, Google conducted an extensive study of more than 5,000 shoppers across 12 verticals in April of 2011, providing a wealth of information about what ZMOT is and why it matters. 70% of Americans look at product reviews before making a purchase. 79% of consumers use a smart-phone to help with shopping. 62% of shoppers search for deals online before at least half of their shopping trips. 54% of shoppers comparison shop for products online. 20% of searches across all Google properties are local. 40% of all mobile searches across Google properties are local. Recipes make up 1% of all searches on Google. I’ll wrap it here and leave you reason to peruse the book for yourself. It’s a great, quick read. Perfect for the too-little-time-too-many-social-networkers and instant-gratificationers among us.And, if you’re Apple-enabled, be sure to grab the free iBook to access multimedia content. Now go forth and ZMOT!